Today I join the fabulous Peachy Keen design team and alumni on a blog hop. We are celebrating all that we are thankful for! Not only am I thankful for my family and friends, but I'm also thankful to be sharing my creations with all of you. I'm thankful for all of my dedicated readers that visit often and especially all of you that leave so many wonderful comments. It's been a tough year for me. Moving and working extra long hours at my full time job hasn't left we with nearly enough time this year. I haven't had time to create many new punch art classes for you all to enjoy. I plan on making the new year a whole lot more productive! If you came here from Saundra wonderful blog, then you are on the right track. If you are just starting the hop here, you definitely want to start at the beginning. Peachy Keen is generously giving away three $50 gift certificates! They will be randomly drawing from the comments on several of the participating blogs. We don't know yet which blogs that will be, so you will definitely want to visit all the stops and comment at each one to increase your chances! I dug out my punches and nestabilities along with one of my favorite Peachy Keen face sets called PK-482 Winter Wonderland Face Assortment. If you don't have this set yet, you should definitely add it to your collection! The sweet little bird, snowman and kid faces in this set will melt your heart. Look at those lashes! Sorry I didn't have time to create a step by step tutorial for you this time. I'm working 70 hour work weeks for the next 3 weeks and barely have enough time to eat and sleep! For the body, I used my Nestabilities dies to cut 4 different size scallop circles. I rolled each into a cone and stacked them like a tree to create the body. Cut the top of the tree off so you can tuck the head into the top. I used the Blossom Petals Builder punch for the wings and head. For the feet I used Boho Blossoms. For the tail, I cut 3 large scallop circle nestabilities and layered the pieces. Cut the sides off to create tail. Cut a slit in back of body and tuck tail into slit. Hand cut a waddle for his face and stamp and pop the beak on top of it. so adorable!! LOVE that little turkey's face! Glad you found some time to share! WoW your turkey is wonderful! I just love him!! I don't know how you do it...but you are so clever!! He is just the CUTEST!!! Adorable work!!! OMG-you work too much!! 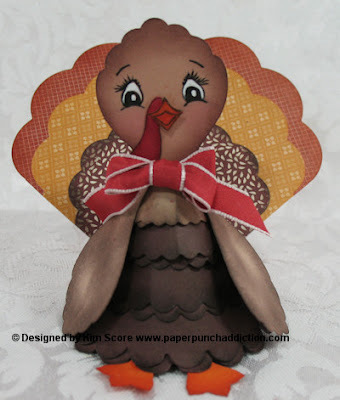 You are so talented that you need to be crafting more...this turkey is amazing!!! Just adorable!! Hope you get a break from all that working, been there done that. Know how you feel!! What a cute and adorable turkey. So super CUTE!!! :) You are so amazingly creative!!!!! That is one sweet Turkey! He is amazing!!! Bless your heart working those awful hours. It hasn't taken away your creative juices, your turkey is adorable! Thanks for sharing. this is amazing!! very creative. Rosemary R.
Once again, Kim, you have created a project that is out of this world cute! Working full time??? 70 hours??? Make some time to rest or you are gonna be wiped out before the holidays! Love your work. As always, thank you! That is the cutest turkey! love your turkey!!! tomany work hours girl! This is so cute! Love how you created the body shape! Your turkey is so cute! Your turkey is just beautiful! What a cute turkey. You are so creative! What a cute Turkey Love it! LOVE THIS SO DAM CUTE!!!!!!!!!! This is way too awesome!! I don't know how you come up with those ideas!! Kim ~ this is just AMAZING to me!! I LOVE your turkey ~ absolutely AMAZING!!! i know i say this ALL the time but what you create with punches and dies ~ just blows my mind! This is just another creation that blew my mind! I hope life lets you take a breathe real soon!! Hang in there!!! You are so creative, your turkey is AMAZING!! Thanks for a chance to win. So super sweet! I hope you get some time to rest soon. This is so darn cute, what a great idea. Thanks for sharing. This is way beyond adorable, Kim! Thanks so much for being a part of the hop! I know how hard you're working, and I'm hoping you get a break soon! HUGS to you! Cutest turkey EVER! Love, love, love! Oh my goodness....this is amazing! I've just signed up to follow your blog. I can't wait to sit down and pour through your creations. I love the idea of using layers of die cut images to create a project like this....just not sure I have the patience to stick with it. Thanks for sharing. I look forward to seeing what else you create. LOVE the turkey!!! You're so very talented! Super cute! Love that turkey. Please do a how to. 70 hours? That's one long week! WTG for finding time to get some fun creating in! Thanks so much for sharing this! The turkey is super cute! Have a peachy day! Kim I don't know how you keep coming up with these great ideas! Your turkey is adorable! What a terrific idea ~ and your turkey is sooo cute! I NEED to come back and spend more time "visiting! Thanks for sharing. Kim you always seem to amaze me- the face is worth a thousand words- thank you Alyse D.
I just love how creative your idea was to use the circles to create the body! Thank you for taking the time to inspire us even though you are crazy busy! Great job. such a sweet adorable turkey. Love it. Please do a video to show us how to do it. Your turkey is the cutest turkey ever; just love him!!! That turkey is so cute! You are super creative! OMGoodness! That little turkey is so cute and fun! This would look adorable on the table for Thanksgiving! Thank you for sharing! Wow!! This is Fantastic!!! My 5 yr old is begging me to make one!! This is so beautiful! He would be such a cute centerpiece. TFS! Wow! What a great punch art turkey! Love the turkey with the cute Peachy Keen face!! OMG I love your turkey. I love how you cascaded the body of Tom!! So inventive! I do enjoy well done 3D projects, and yours is so cute! That is to stinking cute love it TFS. You are right this is such a cute stamp set and I love your turkey! What an adorable turkey, would make a great table centerpiece, TFS!